Some places possess a beauty that isn’t brash or flashy, but still has the power to leave us in awe. They are usually quiet places, and the beauty they possess usually comes from what has been left untouched, rather than from what changes modern man has made. The coastal communities along the Delaware Bay are these kinds of places. Low-lying landscapes create broad vistas over marshlands and groves of trees. Towns tucked up to the bay offer easy access to the water, making them ideal destinations for boating, fishing, and hunting. Because of their coastal presence, these are also the prime locations in the state for viewing the magical migrations of shorebirds. -- Pickering Beach. A good spot to witness the spectacular seasonal convergence of horseshoe crabs and the migratory birds that feed on their eggs. Watch for Red Knots, Sandpipers and Sanderlings. -- Kitts Hummock. There are plenty of great sights and pleasant stops along the way to this town, which is part of the Coastal Heritage Rt. 9 Byway. Check out the historic John Dickinson Plantation, the Ted Harvey Conservation Area and St. Jones Reserve. -- Bowers Beach. There is a beach here, but many visitors come for the eco-tourism, hunting and fishing. Head and charter boats run from local wharfs, and there are public boat ramps offering access to jet-skiing. The public beach is popular among sailboarders, surf fishers, paddleboarders, and sea-glass hunters. Events and attractions include the Buccaneer Bash (Memorial Day) and the Maritime Museum. A quick drive from the Air Mobility Command Museum, golfing, and Historic Dover, and an ideal spot to make a lunchtime foray to one of Delaware’s classic crab houses. -- Slaughter Beach. To this town’s east, the Delaware Bay offers fishing, kayaking, sailing, boating, along with a pavilion and bathhouse. To its west lies Prime Hook National Wildlife Refuge, a world-class spot for bird watching and wildlife gazing. 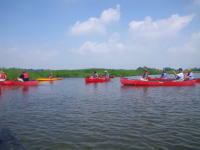 Points of interest include the Fourth of July Regatta, and the nearby DuPont Nature Center. -- Broadkill Beach. Bordered on the west by the Prime Hook National Wildlife Refuge and all its spectacle, Broadkill boasts a collection of architecture that spans from 1930s cottages to ultra-modern homes.